Our Photo Booths will make your event more memorable. Everyone attending a wedding in San Francisco wants to have fun, and that should include the bride and groom! There will be plenty of stress to go around on your wedding day up until the big “I do” moment, but the reception should be the time you get to cut loose a little bit. 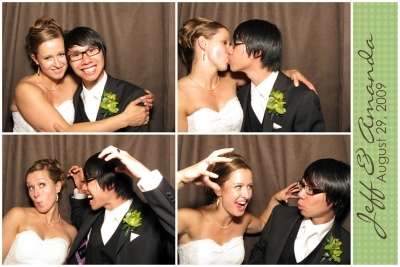 A photo booth is an amazing way to get the party started and get everyone in a playful mood. 1 – Photobooths give people an activity. If you are having a traditional wedding photographer, you and the wedding party are probably off getting your pictures taken right after the ceremony. Meanwhile your guests are milling around at the reception waiting for you. A photo booth gives you friends and relatives something to do while they wait (other than drink). The party can get under way without you, and you will feel less pressured to rush through your own photos. 2 – Photo booth prints make great wedding favors. Think about the wedding treats you’ve taken home in the past. Chocolates? Eaten. A flash drive of photos? Obsolete. A leaky flask? Garbage. A tiny spoon? Back of a kitchen drawer. The whimsical photobooth print, however, usually starts its journey on the refrigerator door, reminding people for months about your wedding day. Having won its way into your guests hearts and minds, it always ends up in the family photo album. Make sure the photo booth you rent prints photo quality pictures immediately, so everyone gets a fun souvenir. 3 – Photobooths are the perfect icebreaker. There will be a lot of people at your wedding who are complete strangers (to each other, hopefully not to you) and the limbo competition can only go so far to loosen them up. It is universally impossible to stay serious while wearing a sombrero and a clown nose. Does your aunt have nothing in common with her 5 year old grand-nephew that she’s never met before? Stick them in the photobooth and watch the smiles magically appear. Over the course of the long night, your guests will need a variety of activities, or just and excuse to escape the dreaded Macarena. So rent a photobooth for your San Francisco wedding, it’s cheaper than the cheese course from the caterer, and can turn otherwise boring corner of your party space into a memorable chorus of giggles. Best photo booth ever! I was immediately impressed months ago when booking them. I filled out an inquiry to get a price and someone called me almost instantly to talk. They designed a banner for the photo strips that looked similar to our wedding invitations which I thought was really cool. The thing I was the most impressed with was how great of quality the photos were. It didn’t look like your average mall photo strip. The pictures were very high quality and many people made them their Facebook profile pictures after we posted them. I’m so glad we got a photo booth. The kids at our wedding loved it when dinner ran a little long for them and adults used it as an extra excuse to get silly. I’m so happy with our experience with A Flying Camera. One of the best decisions we made for our wedding.